Honokohau Harbor is located off of HI-19. 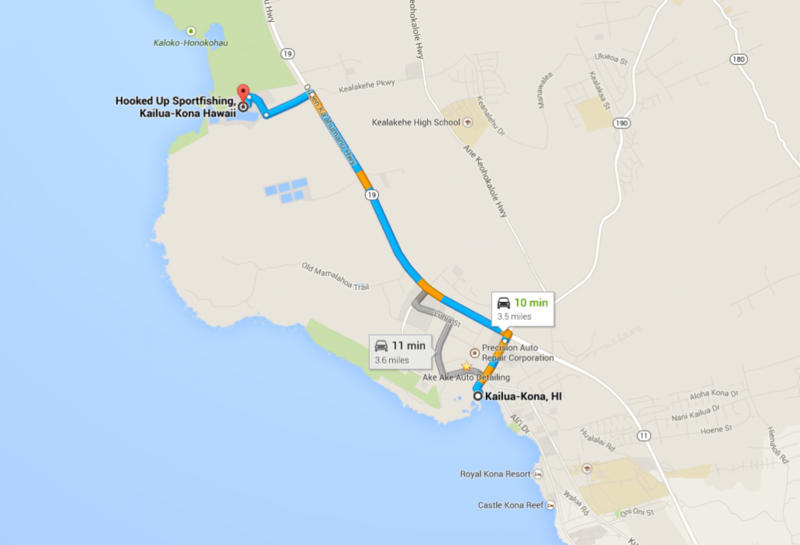 Its 4 miles south of the airport and 3.5 miles north of Kailua-Kona on Kealakehe Pkwy. There will be a stop light and a sign with a marlin on it that says Honokohau Marina. Hooked Up is located in front of the harbor master office that overlooks the whole harbor. Once on Kealakehe Pkwy (harbor road) take the first right then very first or quick left. Park by Hooked Up Sportfishing sign. Down the ramp and 6 boats on the right. Go Get Em is located on the south side of the harbor in the main basin. Once on harbor road go straight and take the third right by the red roof building (public restrooms). You will see the Go Get Em Sportfishing sign. Down the ramp and the 3rd boat on the left. EZ Pickens is located on the south side of the harbor in the main basin. Once on harbor road go straight and take the 5th right past the red roof building then left and park by the EZ Pickens sign. The boat is rt in front of the sign. Can walk to the sign and down gravel path to the boat or down the paved ramp before the sign. Boat is in front of the avocado colored hut.